My favorite weather is upon us! I know, I know. I'm crazy. Maybe it's because I was born in July, but I have always loved the summer heat. My recent trip to India was great for giving a dose of the heatwave I was craving, and bonus: It reminded me of how much I love summer head scarves! India has the most beautiful textiles I've ever seen. Their silk scarves are unreal, really. My lovely BFF and college roommate, Angeline, has been in town for a bit (lucky me! ), so we put together this post on some of our favorite scarf styles. Head scarves are perfect for a few reasons, like if you didn't wash your hair, or if you have really bad roots. Cover it up in style! They're great for looking a little put together when you don't have a lot of time to spend on your hair. Since Angeline and I have (clearly) very different hair types and textures, we decided to show you some of our favorites for curly and straight hair. 1. This is a great standby for a really hot day. 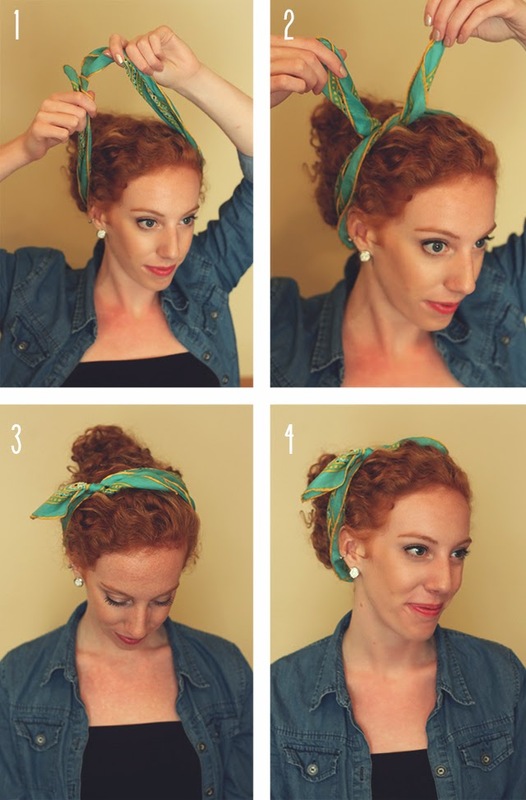 Throw your hair up, keep it out of your face with a head scarf. Folding it into a triangle and tying it on the side gives a cute, retro feel. 2. 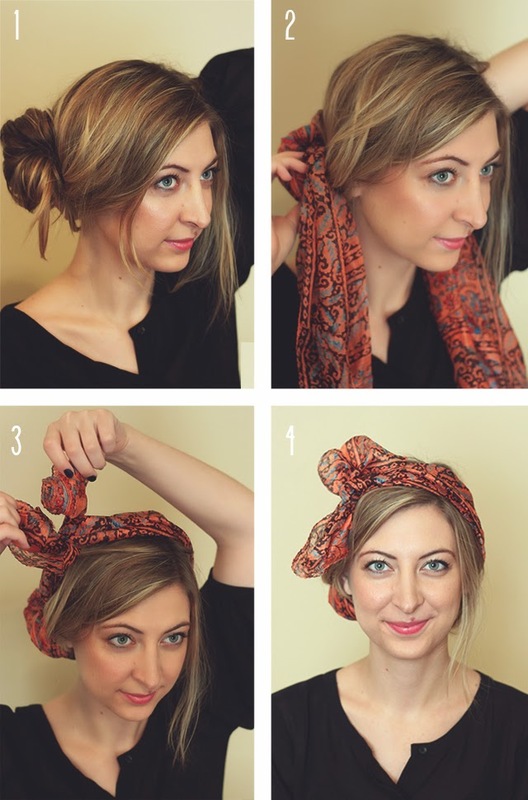 For this look, pull your hair into a messy side bun, and use the scarf to cover the bun. Twist the scarf around the bun if you have a lot of excess fabric, and then tie it in a loose, floppy knot above your head. 3. Every time Ange wears her hair like this, I'm always wondering "How did she do it???" It's easier than it looks! She wraps the scarf around the front of her head, pulls all of her hair to the side, and twist it all together. She keeps twisting until it wraps itself into a bun, and then she uses a bobby pin to hold it together. Side note: Angeline is a bobby pin wizard. I think I would have to use about 15 for my hair to stay like that. 4. 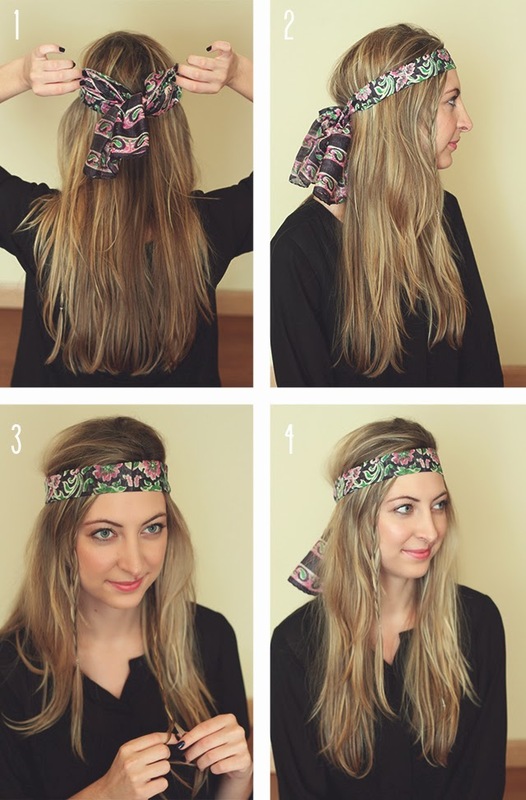 The ole hippie standby, AKA probably the easiest way ever to tie a scarf into your hair. The trick here is to go just a liiiiiittle bit above and beyond tying a piece of fabric around your head. It'll look like you tried harder if you spend about 30 seconds adding a small braid or two. 5. The "Little Bow Peep." 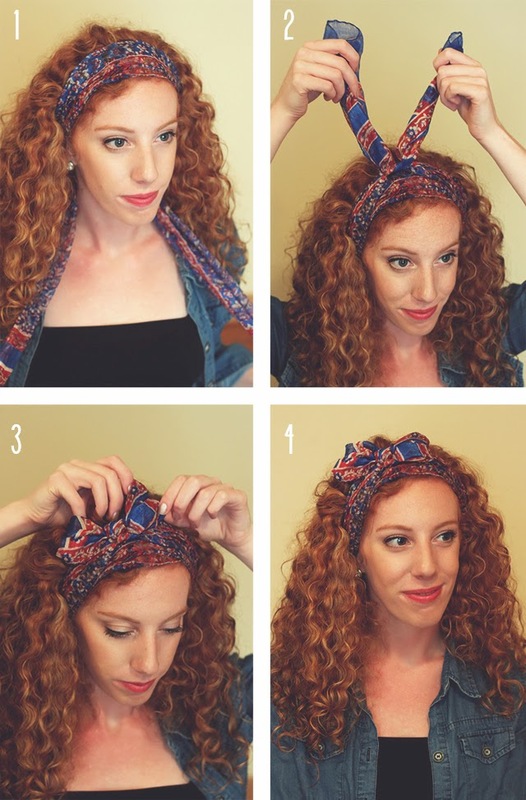 When using a scarf as a headband, make bunny ears (like you're tying a shoelace) with the ends. Then, when you tie the material in a double knot, it will make a cutie little peek-a-boo bow. Precious, huh? 6. 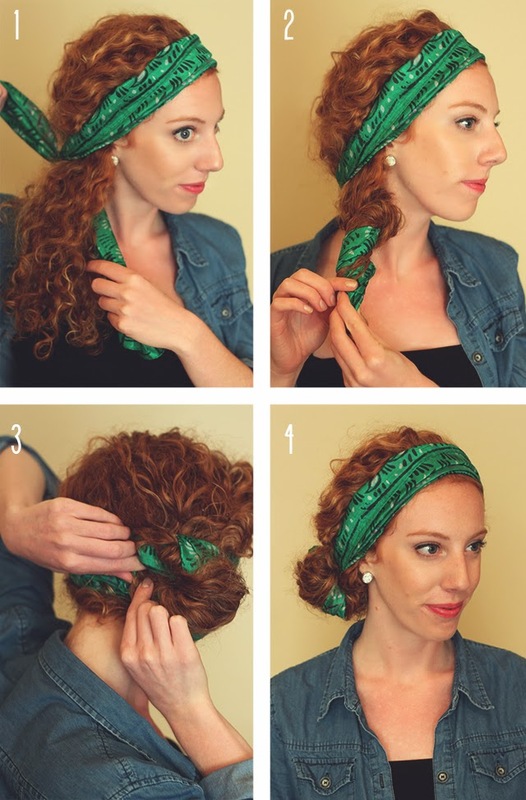 Last but not least, the "tie-your-head-scarf-into-your-braid" standby. The catch on this one is to use a little clear elastic where you would normally tie your hair into a side pony. Then, separate the ends of the scarf into two of your braid strands, and braid on! 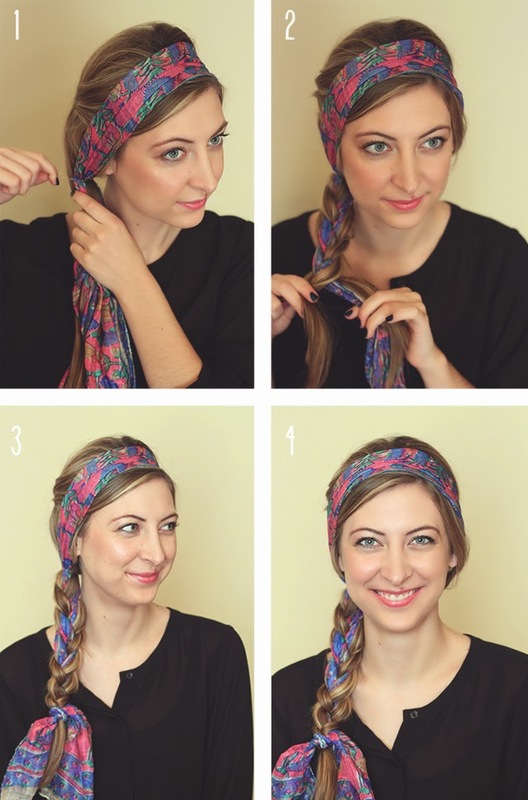 Tie the remaining scarf at the bottom over your hair elastic. 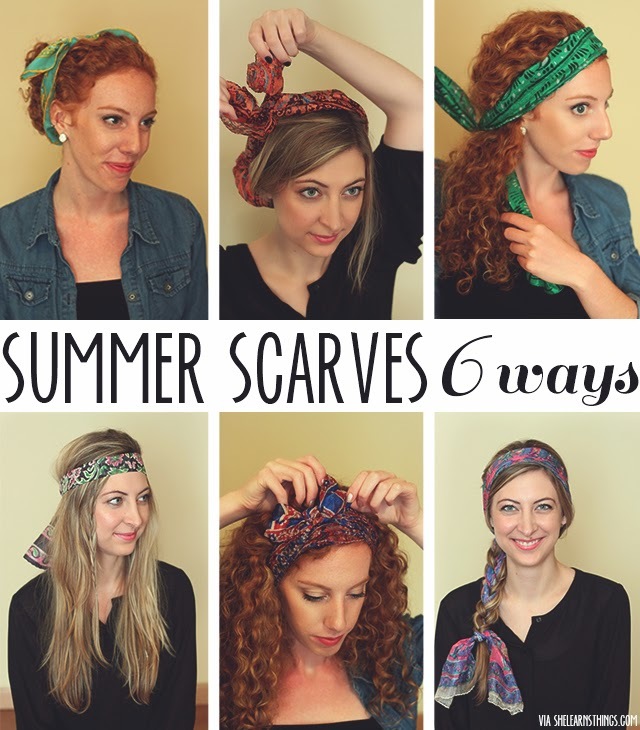 Annnnnd that's it for summer head scarves! Do you guys have any other tips for beat-the-heat hair?